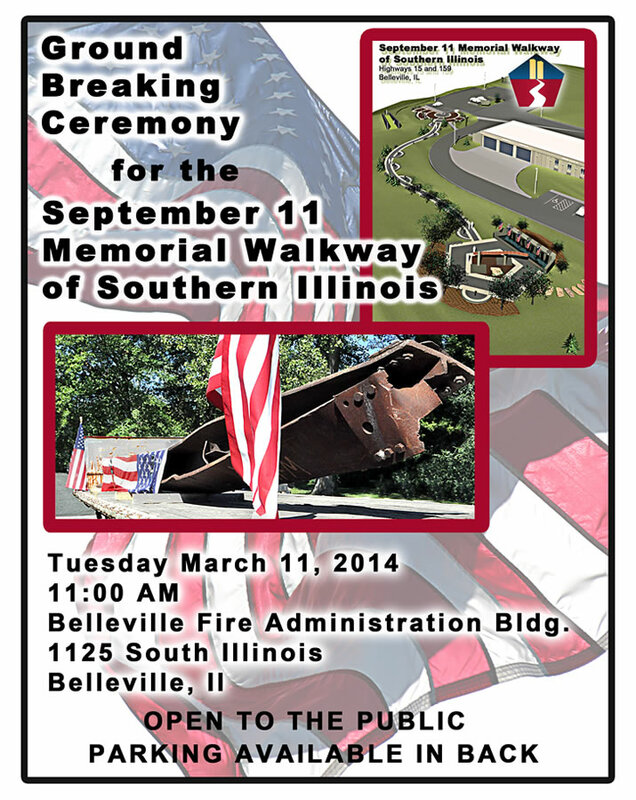 The September 11 Memorial Walkway of Southern Illinois Committee has planned a Ground Breaking Ceremony for Tuesday, March 11, 2014 at 11am. The ceremony will be held at the site of the planned September 11 Memorial Walkway at 1125 S. Illinois Street, Belleville, Illinois. The public is invited. The first phase of construction on the memorial will begin within the next few weeks, weather permitting. When completed, the memorial will honor the victims and survivors of September 11, 2001 and will feature an actual steel column from the World Trade Center in New York that measures 35.25 feet long and weighs 7,106.9 pounds. Additional features will help to depict the tragic events that also occurred at the Pentagon and on Flight 93, making it an important historical and educational resource in Southern Illinois for generations to come. The committee hopes to have the memorial completed by September 11, 2014. For further information, please contact Cathleen Lindauer at 618.233.6769 or clindauer@bellevillechamber.com, and/or Sharon Strausbaugh at 618.233.6518 or sstrausbaugh@belleville.net.